Paul: Hey Mario. Are you OK? You seem angry or stressed out. What's going on? Mario: Hi Paul. I'm OK. It's just my summer school class. It's really difficult and I'm thinking about quitting. Paul: Really? But you're such a good student! I think you should stick it out. You only have 2 weeks until it's over! Mario: Maybe you're right. 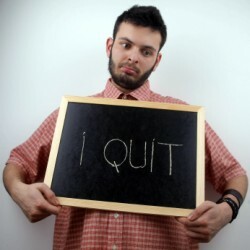 If I quit, I will certainly regret it! Studying English in the United States can be difficult at first. You may experience culture shock, loneliness, confusion, and more. For some students, the feelings are so negative that they think about quitting and going home! However, if you stick it out, it can be one of the best decisions you have ever made! You can meet many new people from all over the world at your ESL school and learn about different cultures. You can make friends with native speakers and really improve your English! If you do these things, you will be so happy that you stuck it out! to stick it out = not quit even though the situation may be difficult/unpleasant. This expression is used for temporary or semi-permanent situations that have an ending date such as a class, contract, study program, etc.